for helping to make this collaborative event possible. EMWH recognizes that there are many challenges to preserving a healthy, biotic community here in Montana; one of which is predator - human conflicts. By nature, predators do what they are instinctively drawn to do - kill and eat prey. But, for the livestock rancher, who has a vital interest in the welfare of their livestock, predators can be seen as an enemy threat from which property needs to be protected. Non-lethal predator guard dogs and Rangeland Stewardship offer the livestock rancher an opportunity that is pro-active for predator risk reduction tool, rather than only being able to react to an attack, after the loss occurs. Livestock Guardian Dogs can also be a cost effective method for managing predation. 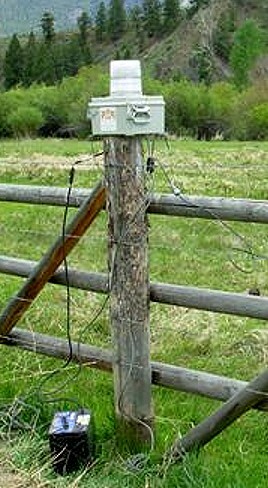 Nothing is foolproof and not every tool will work for every livestock rancher, and their landscape. 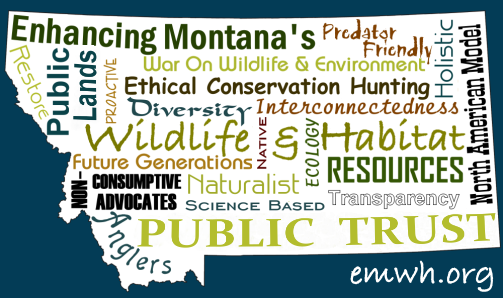 EMWH would like to present some of the possibilities available to assist the livestock interests in protecting their valued property, while encouraging at least the tolerance, or the acceptance of wildlife predators on the Montana landscape. This opportunity can not only bridge the gap between predator and livestock, but will hopefully assist in mitigating the human conflicts between wildlife conservationists and ranchers as well. 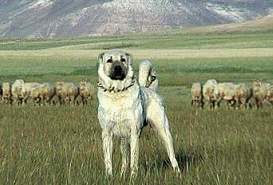 Livestock Guardian Dogs (LGD) / Livestock Protection Dogs / Predator Guard Dogs are not the same as shepherding dogs. LGD are medium sized to large breeds that live permanently with ‘their’ stock, protecting them from anything that they see as a threat through confrontation, disruption and territorial exclusion. 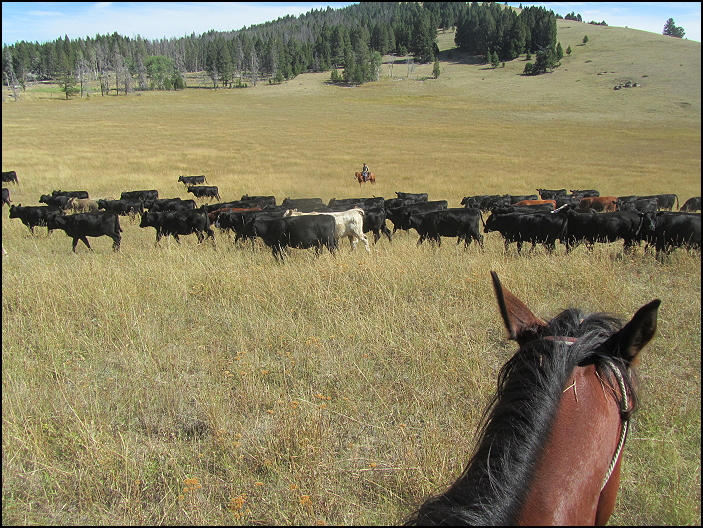 Range riders using rotational grazing at high stocking density and herding with low-stress livestock handling. George Edwards, Livestock Loss Board, Helena, MT, Executive Secretary - Montana Livestock Loss Board grants for LGD's and dogfood to assist livestock producers in undertaking proactive, nonlethal activities to reduce the risk of livestock loss from predation by predators. Peggy Duezabou, Sheep rancher, dog trainer and Akbash dog breeder, Silver City, MT. Baccalaureate Degree in Psychology (University of Montana) and a Master of Science Degree in Animals and Public Policy (Cummings School of Veterinary Medicine at Tufts University), worked with LGDs at both the Sheep Experimental Station near Dubois, ID and the New England Farm Center at Amherst, MA. Becky Weed, Thirteen Mile Lamb and Wool Company, Belgrade, MT - Predator Friendly, Our principal protection against native predators are our guard dogs and llamas and our own vigilance; because we have chosen not to use lethal control methods against coyotes, bears, wolves, mountain lions, our ranch is certified as "predator friendly". Matt Barnes , Keystone Conservation, Field Director, Rangeland Stewardship - rangeland management specialist and wildlife biologist. Presenting Rangeland Stewardship For Livestock & Predator Co-existence. 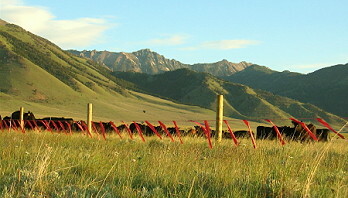 Hilary Zaranek, Range Rider and livestock producer - flandry (flagged fencing), handling cattle using low-stress stockmanship techniques on a landscape with both grizzly bears and wolves. Livestock Guardian Dogs - Working on Common Ground from Conservation Media on Vimeo.